4" x 5" Neon Message Notes. 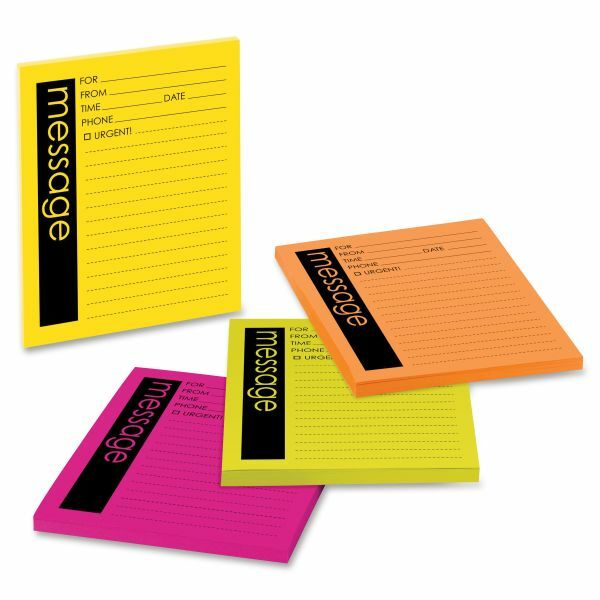 Eliminate lost telephone messages with these self-adhesive, telephone message pads. Preprinted prompts include caller, time, date and phone number. Message-taker can check the box next to Urgent! for important messages. Note: A minimum quantity of 108 must be ordered, and in units of 18 thereafter. Post-it Neon Important Message Pads - Eliminate lost telephone messages with these Post-it Telephone Message pads. Messages stick securely and won't fly away. Neon colors include Ultra Pink, Yellow, Lime and Melon. Each pad contains 50 sheets with one message per sheet. Preprinted prompts include ones for the message recipient, caller, time, date and phone number. Message-taker can check the box next to Urgent! for important messages. Paper used comes from well-managed forests where trees are replanted. One message per sheet; 50 Sheets /Pad; 4 /Pack.